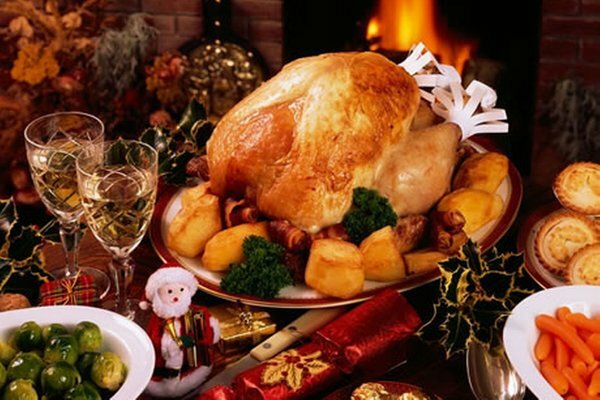 Christmas is one of the few holidays when the whole family gathers around the table to take a grand feast. 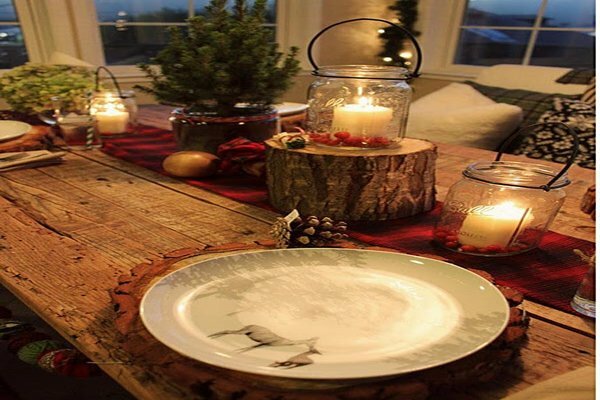 A beautifully decorated table creates a perfect Christmas atmosphere. 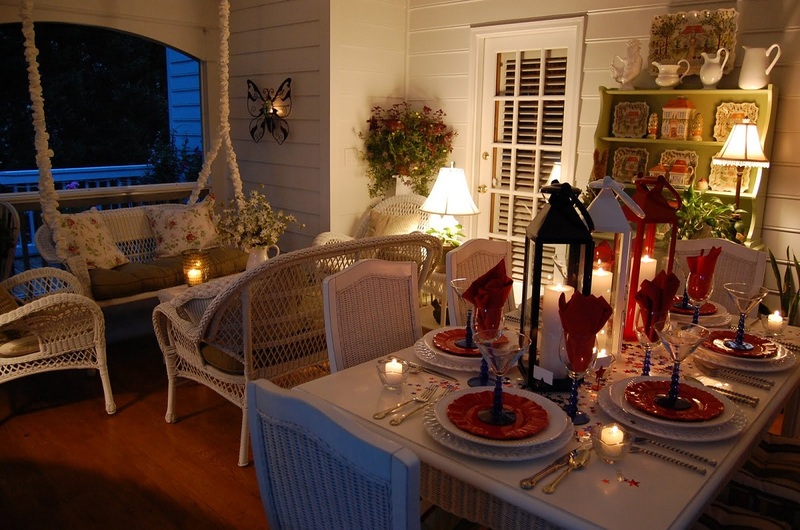 It sets the mood for an evening with friends and family and creates an enchanting gathering. It does not require much effort and imagination to make festive Christmas dinner table decorations. You only need to use your creativity and imagination. 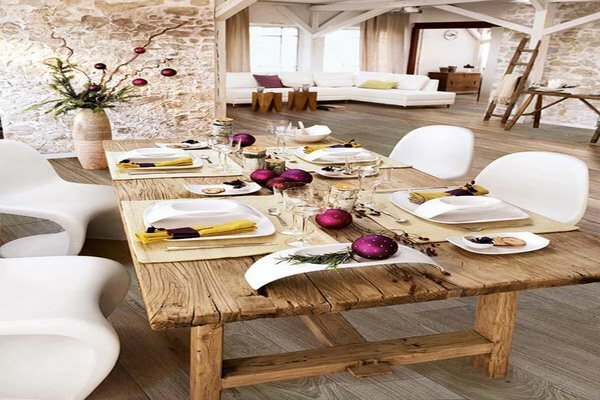 Here a few tips, tricks and ideas to transform your ordinary dining table into a stunning centerpiece for your guests. Mr. Robert from robertsdonovan.com, says that his father in law asked to take the picture of the Christmas table centerpiece arrangement. He has come up with real good inspiration for all of us. The mix of modern and traditional details will make your dining room the perfect setting for a holiday gathering. You can never go wrong with flowers for table decoration. Bright and vibrant flowers will make the room appear lively and more inviting. 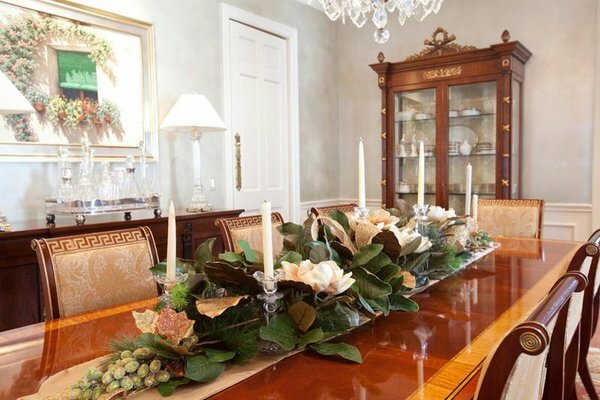 However, it is advisable to use the flower arrangement at a low level so that the guest can talk to each other. You can use an arrangement of candles, flowers or garland to create a dramatic centerpiece. 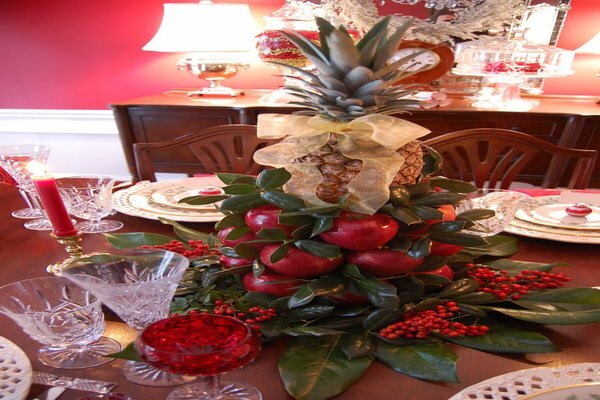 Place a bowl of fruit for your centerpiece. Put together a bowl of apple, oranges and cranberries along with greeneries. You can also place ribbons along the centerpiece to add a touch of color. Remember, centerpiece performs a decorative function; therefore the size of the centerpiece should be as per the nature of the meal. If you are organizing a party for the boss or colleague, then the centerpiece should be smaller, and if the dinner is for the family and friends, the centerpiece should be well decorated. Also, while planning the main centerpiece, keep the height in mind. The centerpiece should not interrupt your conversation and the diner’s view of each other across the table. Leftover ornaments like shiny balls, bells and stars will look great scattered along the table. 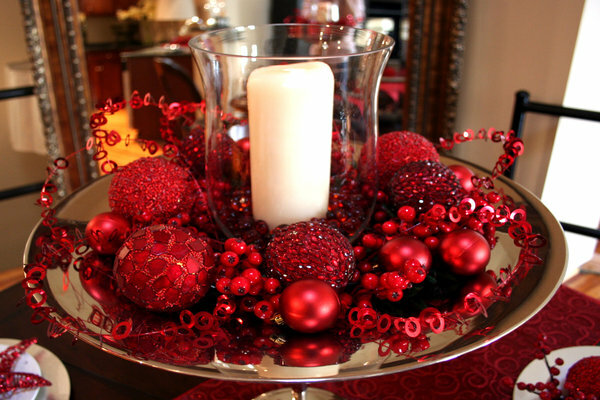 Put a cluster of Christmas ornaments in a bowl or a cake stand and place it on the table for a stylish table setting. You can also sprinkle some faux snow over the display. 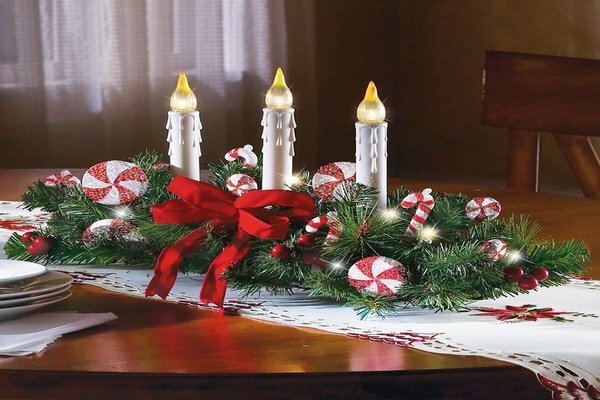 This idea will give a festive dining setting to your house. 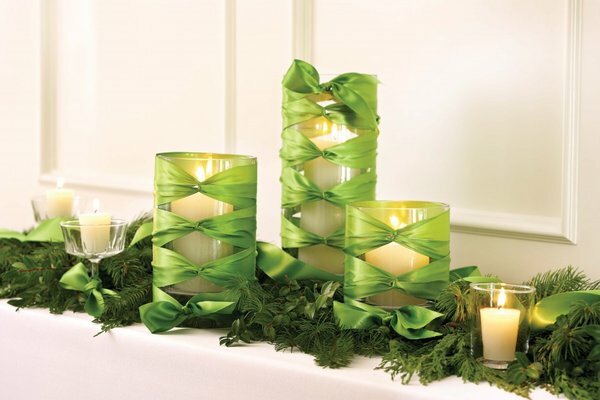 Soothing candlelight creates the right ambiance for the holidays. Candles placed in a clear glass will make a nice centerpiece. It will also not obstruct the view across the table. Do not use real candles as they can pose a problem, especially if kids will be attending your party. Get LED candles instead, as they are much safer. Do not use scented candles as they can interfere with the aroma of the food. The Christmas tree is not the only place to hang the gifts. You can show your gift-wrapping skills on your festively decorated table as well. Wrap the plates with beautiful wrapping paper and then tie a satin ribbon around it. Alternatively, put the cutlery and serviette on top of the plate and tie a ribbon around it as if you are going to present it as a gift. 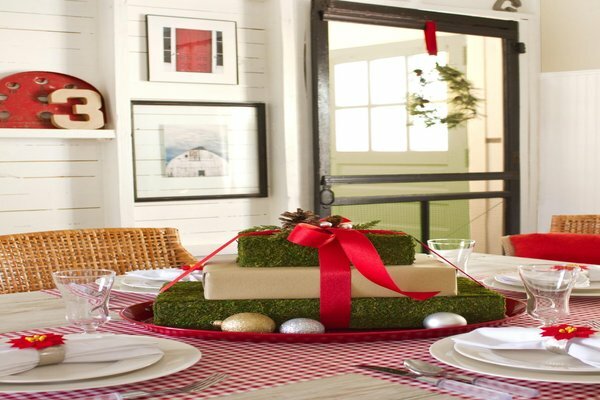 This simple idea will transform your basic table accessories into beautifully wrapped decorations. Glassware with simple, silver trim will make an elegant dinner setting. You can also place a table runner in silver sequins to add sparkle to your dinner table. Red and white are the signature colors of Christmas. 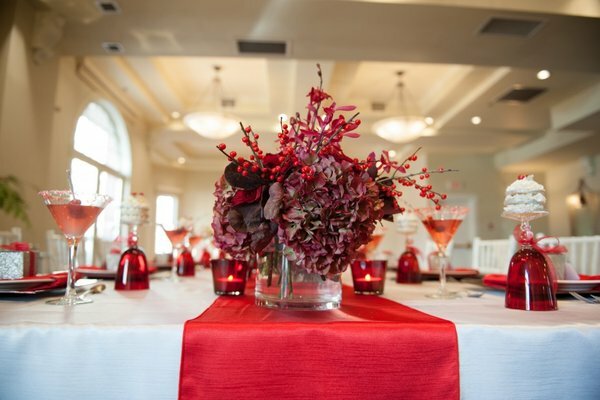 Red and White setting will look amazing on a bare wooden table. Christmas is not always about sparkles and glitter. 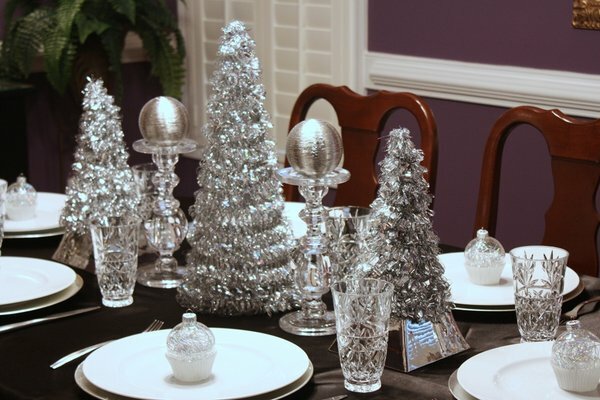 You can host a Christmas dinner on plain white plates and metallic silver dishes. You can also consider keeping wooden candelabra as a centerpiece. 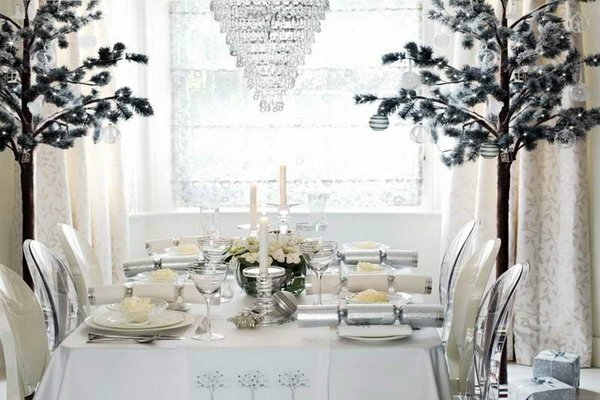 You can never go wrong with an all-white Christmas theme. A white table setting will give an extra wow factor to the overall décor. If an all-white décor is not your choice, then you can add a touch of color by using colorful plates and glasses. It will give a chic look to the otherwise traditional décor. You can replace the traditional red and green with gold and silver accessories. 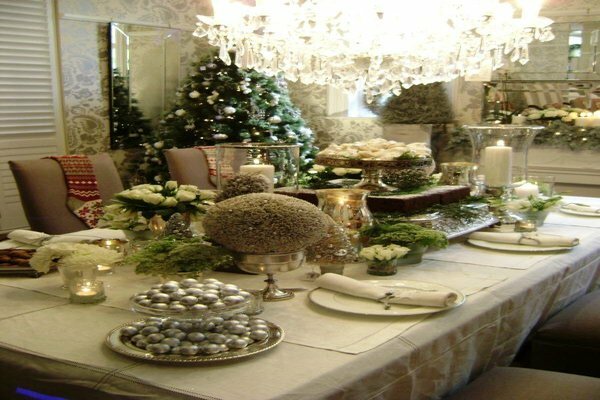 This year, opt for golden or silver candles, napkin rings, pine cones and other decorative accents to decorate the tables. The flickering flames from the candle will create a warm atmosphere. 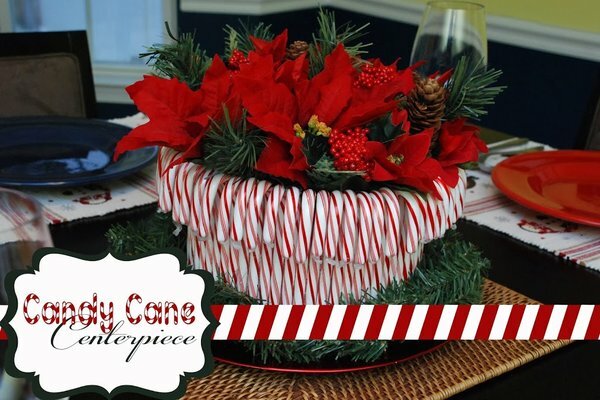 A candy cane table arrangement is appropriate for Christmas. Tie the peppermint stick around a rectangular vase using a red and white ribbon. You can also use a hot glue to affix the candy canes and then tie it with a ribbon. Then place red roses or red carnations in a vase. It will make a beautiful table decoration. Spray some coats of clear acrylic spray to avoid stickiness. 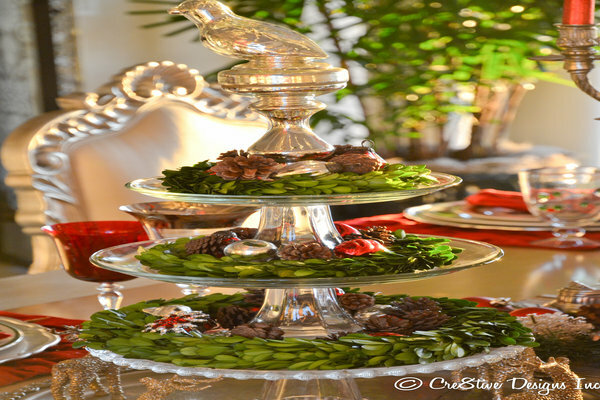 Here is an awesome way to use your pedestal dish as a fun decoration. 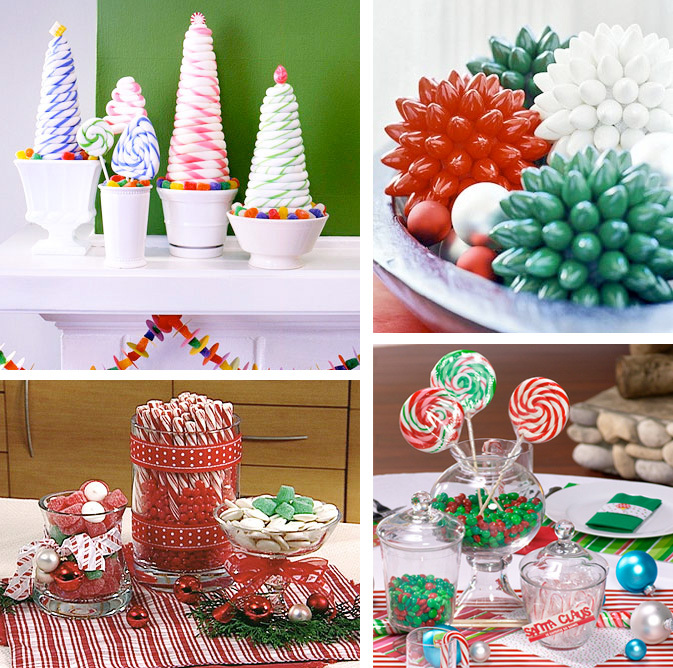 Layer the dish with ornaments, figurines, fruits and even pine cones for display. You can also display your Christmas card on a tiered pedestal dish along with small presents, ornaments, and artificial greens. Apples will make a perfect display on the dinner table. Fill a glass jar or bowl with apples. Then mix in some loose greens. It will give a wintry feel to it. Place the jar or brown on a beveled edge mirror. You can also mix in some ornaments, cranberries and candles of different sizes. 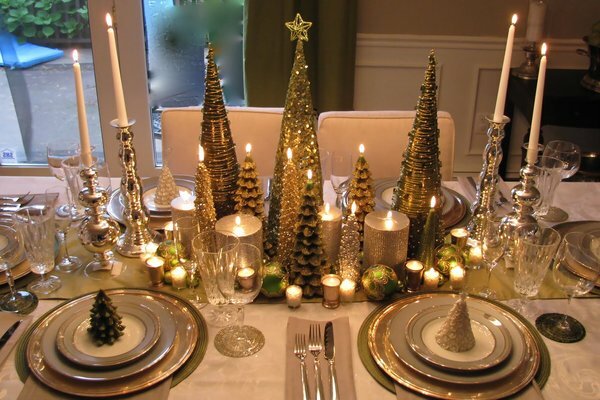 This year, make a mini Christmas tree as the focal point of the dinner table. 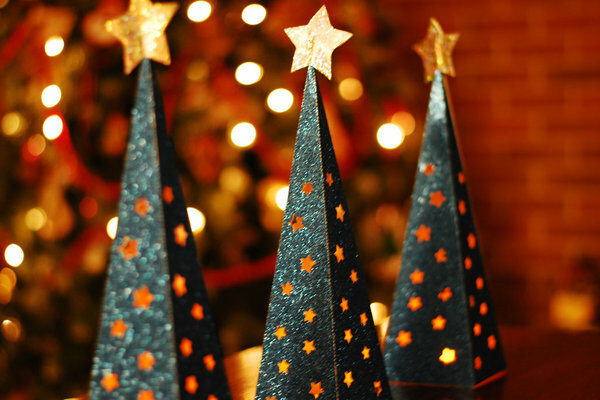 Take a mini artificial Christmas tree and adorn it with lights, paper stars and other tiny ornaments. Place the tree at the end or the center of the table. Greeneries give an organic look to your dining table. Take a miniature evergreen tree and adorn it with cinnamon sticks, acorns, and pine cones. Place it in the center of the table. You can also opt for an all green table arrangement. It will look extremely elegant. 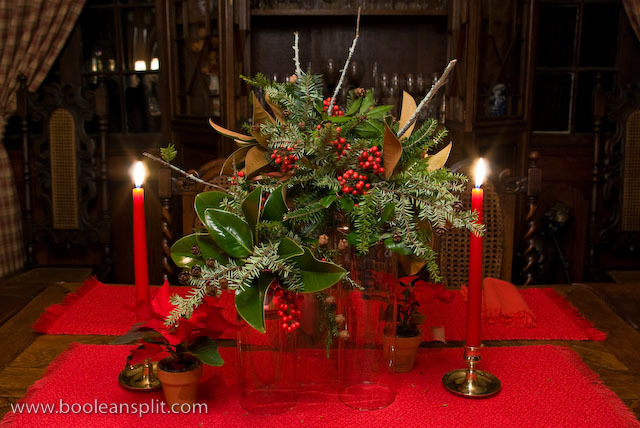 This table decoration idea is for families who celebrate Hanukkah and Christmas together. Place a menorah on the side of the tray and fill some colorful ornaments on the remaining side. 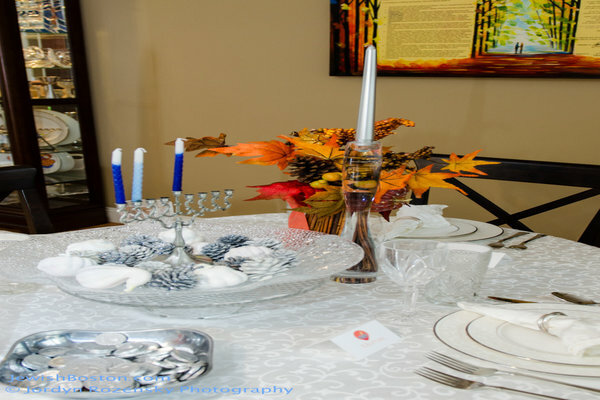 You can also place mini menorah and Christmas tree on a silver tray. Transform white paper bags into luminarias for a glowing centerpiece. You need minimal things for making this table decoration. Use battery operated lights instead of candles for extra safety. 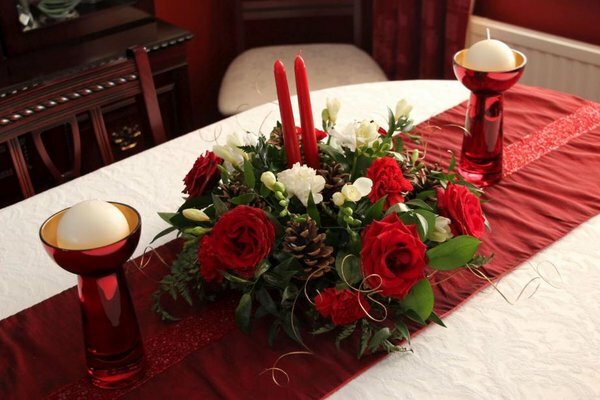 Tulips make stunning Christmas table arrangement. 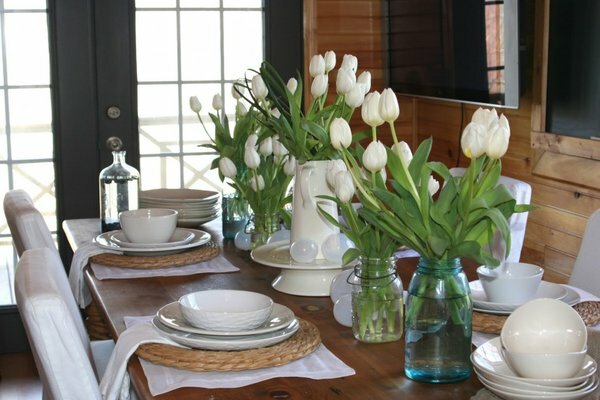 Arrange tulips alongside pine branches for contrast. Place the arrangement in a tray or pail and adorn with ribbons. Attractive tableware adds charm to the table. A dark table will look beautiful with simple white porcelain. Coordinate the color of your tablecloth, crockery and centerpiece to create a stunning look. If you have a glass table, then you can use dark, rich colored tableware to create a beautiful effect. Make sure the crockery is clean and unscratched. How can you forget napkins, tablecloth, and napkin rings while setting the table? Use an impressive tablecloth teamed with a table runner, place mats, and napkins. 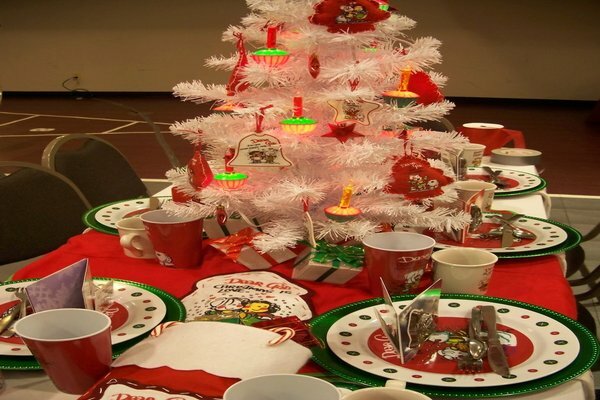 You can use tablecloths based on the holiday theme. Do not use bold printed tablecloths, as they will take away the attention focused on the centerpiece. You can also create your own napkin rings by hand painting the desired motifs on plain napkin rings. The pattern or motif should reflect the spirit of Christmas. First and foremost, look at the decorative elements in your house and decide which one will suit the best. 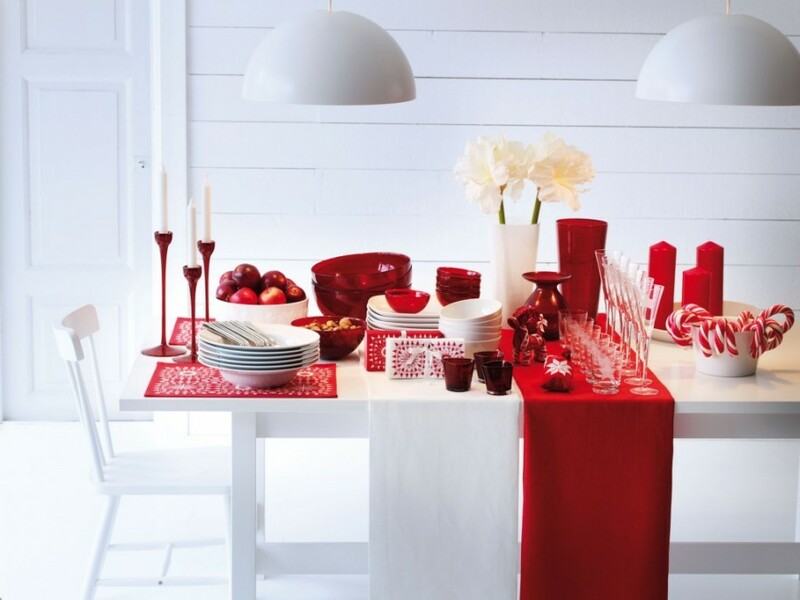 Before you start decorating the Christmas table, decide on a theme or color you would want to give your room. Choose your color scheme before you shop for the decorating items. The table decoration should go with the theme of the room décor. You do not need to stick to just one color. You can experiment with two or more colors, but do not go overboard with it. Color combination of red, green, silver, white and gold are the popular color choices. However, dark purple or natural brown can also make great Christmas colors. Do not forget to accentuate the table decoration with small accents like place cards, napkin holders, wine glass tags, napkins and so on. It will add detail to the decoration. You can also place side tables with festive decorations. Consider decorating the chairs along with the table. You can tie ribbons, net bows and even Santa Claus cap around the chair. Consider the age range of the guests who will be attending the party. If children will be attending the party, then use washable linen napkins and tablecloth. Display your best dishes for a Christmas party. Take out those that you do not use on a daily basis. If possible, keep separate tableware for Christmas and other important occasions. Also, choose nice glasses for beverages. We’re sure these interesting ideas and guidelines will dazzle your table setting. Do not hesitate to take ideas from friends and family members. Working together with near and dear ones is not only enjoyable, but can be creatively productive as well. We hope you have a memorable Christmas dinner with your family and friends.